Chris Pennell is still hopeful he can get back into contention for a place in the England team following a wasted, injury-hit Autumn. But the full-back admits he faces huge challenges, having made his England debut just weeks after Worcester's Premiership relegation in May. "It's certainly not the norm," the 27-year-old told BBC Sport. "But the one thing that has been shown by England's management is that they're prepared to give people opportunities." Despite playing in a struggling side at Sixways last term, Pennell's performances earned him the honour of being shortlisted for the Premiership's player of the season award. "For England to name me among the list of injured players means that all the things said to me in the summer, about keeping me involved, were true. They're men of their word, which means a huge amount." Even when Worcester were relegated, and Pennell made it clear that he would not be leaving his hometown club, the England door remained open. "It gives guys playing at the bottom end of the Premiership, or here at Worcester and at Bristol and other Championship teams, that extra bit of incentive that maybe they are keeping an eye on us if we're putting our hands up every week," said Pennell. What most inspired him, however, was the postscript that accompanied England coach Stuart Lancaster's squad announcement for the Autumn internationals. Having been listed as a 'Player unavailable because of injury', Pennell received a boost at a time of great off-field frustration. "They didn't need to do that," said Pennell. "All the feedback I've had from them has been positive and they showed me that faith in the summer. "For them to name me among the list of injured players means that all the things said to me about keeping me involved were true. They're men of their word, which means a huge amount. "And I genuinely feel, if I can get back to the top of my game, that they will consider me for things going forward." Now Pennell is fit again, having made his comeback with Worcester over the last two weeks, it also sets up the intriguing prospect of him being part of England's Six Nations squad in the New Year - long before the Warriors' challenge for promotion back to the Premiership through the Championship play-offs. The England Under-19 international made his Warriors debut in the 2007-08 campaign, going on to make 12 top-flight appearances. After being struck down by a bad knee injury the following season in a European game, he returned to full fitness in 2009-10. Just a few weeks after being named club captain in 2010, he was then hit by an ankle injury that ruled him out of the first half of the Championship promotion-winning campaign. After signing a new contract in January 2013, he made his 100th appearance for the club in April, scoring his 20th try. 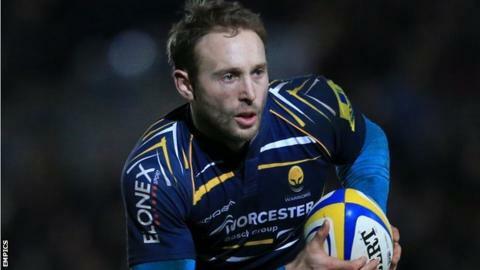 After committing his future to Worcester despite the club being relegated, Pennell is named on the six-man Premiership player of the year shortlist. The son of former England Test cricketer Graham Dilley, he became the first Worcester back to be selected by England when he made a late substitute appearance in the first Test against New Zealand at Auckland in June. "It's interesting dynamics the way it's structured," he said. "And it won't do me any harm. "In an ideal scenario, if I can get myself in the Six Nations, that is going to make me a better player for the play-offs, getting used to that big-match environment. "It's all well and good having these aspirations. Now it's all down to me. "I'm now eight weeks post-op and, in terms of rehab, everything has gone to plan. It's just a question of building up game time, getting match sharpness and then putting my hand up for the next round of Championship games. My target is always simply to get out on the field for Worcester and nail down that starting spot for as many weeks as I can. "And, if I'm doing my job right, hopefully it will have a positive influence on the rest of the team as my ultimate goal is to get us back up in the Premiership. "The Championship gets stronger and stronger each year. Last time we were down here, you might have a couple of weeks when you did not need to be 100% to beat a team fairly comfortably. But the vast majority are now full-time professional clubs. That has had a big effect. A lot more teams can now stay in games for 80 minutes and really compete."